I’ve always loved reading. I can remember (aged 6-7?) looking forward to every Thursday afternoon, when my sister and I would be taken to a local newsagent for a comic. 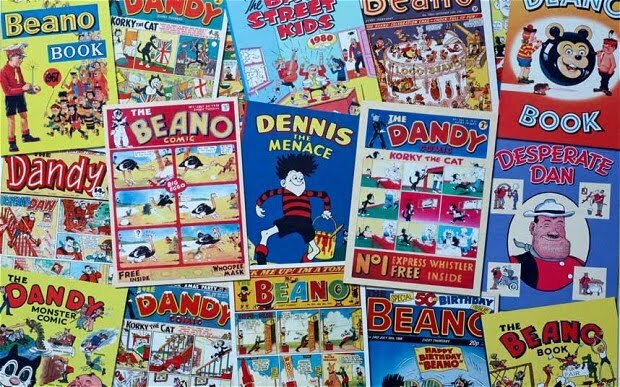 My first reading material consisted of The Beezer, The Dandy and The Beano. At the age of 9, my mum left me for an hour in the local library. By the time she returned, I was hooked on books. I can still remember the first library book I took out on my new library card - Gorilla Adventure by Willard Price. I was enthralled by this story of 2 teenagers who travelled the world capturing wild animals. I ended up reading most of the titles in the excellent Adventure book series (I seem to recall it being called ‘The Adventures of Hal & Roger’ – a UK printing possibly?). With the recent migration of my data from Shelfari, I wondered – what have I actually been reading? After importing the data into a local database, I decided to take a look. Since November 2011 (when I signed up to Shelfari), I’ve read 332 books. 29 of these were second readings, so this brings the total down to 303 unique books. So, how many books do I read per year? So I vary from 56 to 91 books per year (over the 4 full years of data, 2012 to 2015), averaging at around 74 books. If we look at the type of books (fiction/non-fiction), does this help explain the variability in the number of books read? I would expect the number of books to decrease if I’m reading more non-fiction in a given year. My impression is that it takes me longer to complete a non-fiction book, and I’m also less inclined to start a new book after I finish. Over the past few years, I’ve enjoyed reading Patrick O’Brian’s amazing Aubrey–Maturin series (think Jane Austin on the high seas), the Harry Potter books, A Song of Ice and Fire (the book series on which the TV series Game of Thrones is based on), as well as several science fiction series from the talented UK writers Paul Mcauley and Stephen Baxter. The Asian Saga from James Clavell is a series I return to time and again. As you can probably tell from the list above, I like reading complex novels, preferably in a series, with intricate plots and multi-facetted characters. One author who is not featured above is Frank Herbert – I still consider his Dune series the best writing I have ever read. I plan to read it again soon. I especially enjoy science fiction (Macauley, Baxter, Gibson - Neal Stephenson just fell outside the top 10) and Fantasy (Martin, Gaiman and Rowling). American Sniper Chris Kyle, Scott McEwen, Jim DeFelice Very poor, jingoistic fare. Tells a completely different, and much grubbier, story than the film of the same name. I found this book very depressing reading indeed. The Bone Clocks David Mitchell Very disappointing. After enjoying the wonderful Cloud Atlas so much, very let down by this novel. It read like a terrible 1950's pulp Sci-Fi novel. Yet there was the odd glimpse of some great writing. Such a pity. Slow-Tech Andrew Price Rubbish. The author has a very poor understanding of sound engineering principles. The book reads more as a left wing diatribe, as opposed to a serious discussion of how to improve design choices. A Discovery of Witches Deborah E. Harkness A truly dreadful book. I threw the book away after approx. 30 pages. Dire stuff. I regret putting David Mitchell in the above list – he is a fantastic author (Cloud Atlas, Black Swan Green), but Bone Clocks was a great let-down. At some point, I hope to spend some time analysing the hashtags I associated with each book in my reading list. I’ll update this post with the results. Until then, happy reading!